This wedding reception took place at the Twin Owls Steakhouse Garden Room, located within a renovated 1920's cabin. It is an intimate room which seats up to 55 people, next to the larger restaurant venue. The setting has a romantic ambience which is enhanced by the large fireplace, which the head table can fit nicely in front of. There is not much room for dancing, so it works well if you want to talk more than dance. Jerica and Carter's wedding took place in January, without snow on the ground surprisingly, and they were able to get married outside. Luckily Black Canyon Inn is great about providing blankets and heating lamps for guests to keep everyone warm. 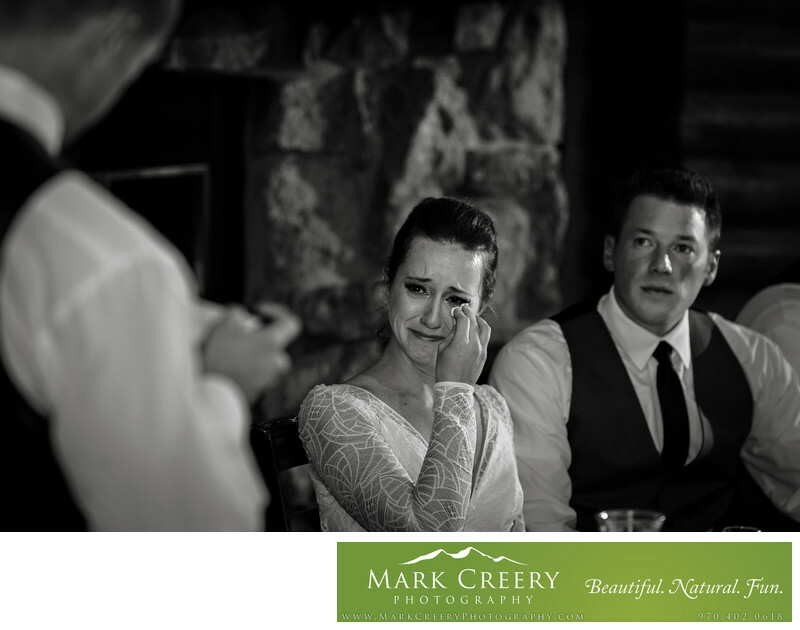 In this photo, the bride's brother gave an emotional speech that really touched the bride (and everyone else too for that matter!). Weddings are a perfect time to share those feelings that may not have been put into words before. It was the kind of moment I live for as a photographer. After the reception the couple did a send-off with glowsticks outside. Location: 800 MacGregor Ave, Estes Park, CO 80517.